Join host Frank Edward Nora his daily commute, walking through the streets of NYC, as he discusses a dizzying myriad of topics. This show is an experimental “spinoff” of Frank’s main show, The Overnightscape (which continues on as normal). The show is recorded directly as a 128kbps MP3 file on an Edirol R-09 portable recorder. This makes it much easier to release the recordings, since no post-production is required. Also, at least to start with, the shows will be released without show notes to further speed up the release process. “The Rampler” is released here on The Overnightscape Underground, but it exists outside the standard “Day” format – again, to make it easier to very quickly record and release. 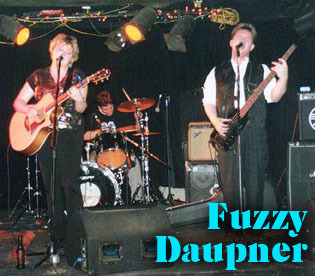 Check out Fuzzy Dauper at The Saint (8/18/01) over on The Overnightscape Underground. It’s a great live show that I’ve been listening to a lot lately – it really captures the band’s amazing energy. Fuzzy Daupner broke up a few months after this show, unfortunately – but with this recording (and more like it to come) the music is alive once again!! Also included are the complete lyrics to each song.